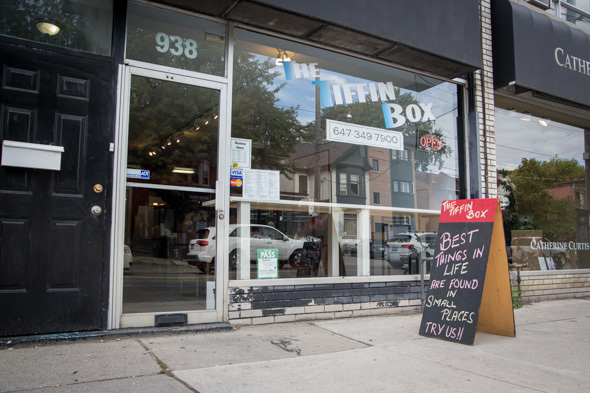 The Tiffin Box on Bathurst just north of Bloor is an inviting nook despite its somewhat rough looking appearance. The two month old room consists of just a handful of tables and is absent of any sort of decoration to help establish its identity -- of course the thick scent of curry does the job all it's own. 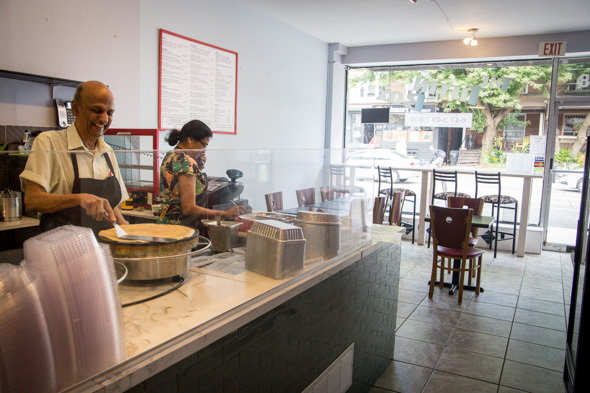 Reassuringly, the mom and pop operation lets the open kitchen speak for itself, it's obviously very clean and organized; fragrant curries and stews simmer away in the hot table, while fresh vegetables and herbs are kept cool and at the ready to finish off each dish. The menu lists various snacks, salads, curries and dosa. Curries like the lamb feature moist chunks of tender slow braised meat in a rich aromatic sauce. 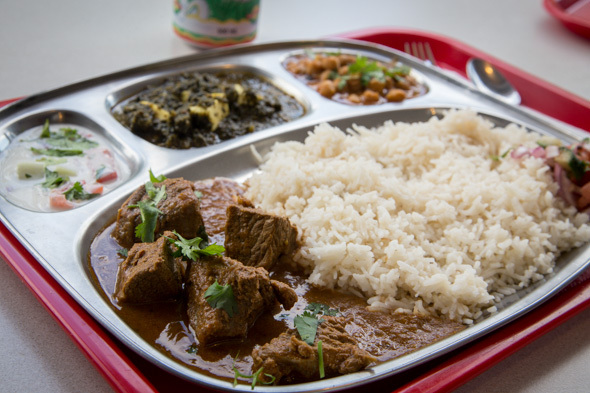 The best bet is to order the Thali ($9.95), a compartmentalized combo featuring any one meat and two vegetable dishes plus fluffy basmati rice, house-made raita and chopped salad. A vegetarian version with dhaal (lentils) instead of meat sells for $8.95. 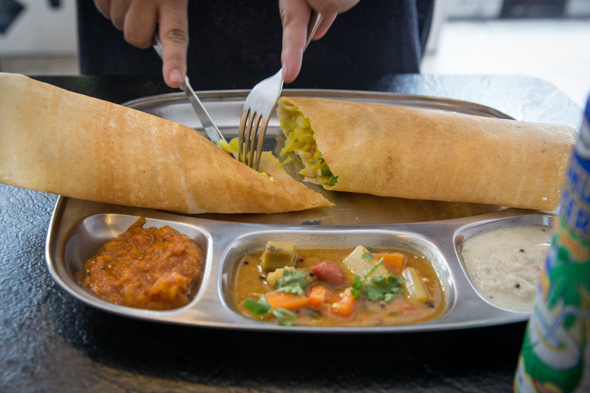 I'm here for the dosas, tipped off by our own reader poll that named them some of the best in the city. 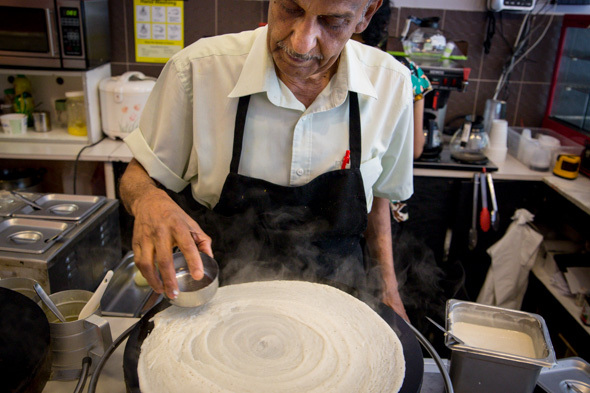 Made of fermented rice flour and urud dhal, the naturally gluten-free crepe batter is spread thin and browned on a tava to order. Stuffed with a choice of five fillings, the options include palak paneer, curried lamb, butternut squash or chicken and cheddar. I go classic with the Masala ($6), a curry-spiced blend of potatoes and onions flecked with carrots and peas. The crepe itself is slightly spongy and once rolled around the savoury masala, it cools to a crisp. Accompaniments are what really seal the deal: here's a subtly sweet coconut chutney and another pleasantly tangy tomato onion chutney, as well as sambar, a deep lentil broth swimming with chunks of vegetables. 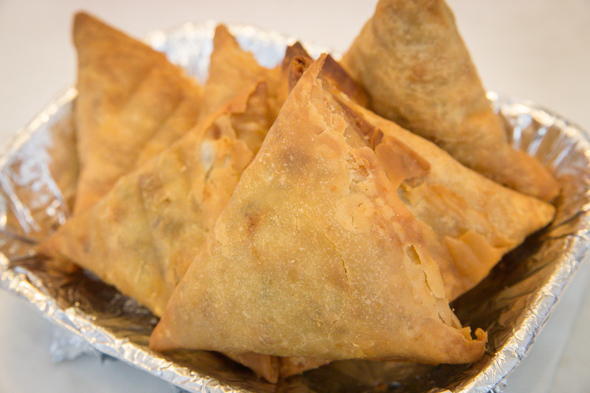 Gold samosa triangles are ready-made and waiting by the cash register -- priced two for $2, they're an easy sell. Even after finding myself too stuffed to manage another bite, the potato and pea stuffed pockets are worth ordering for the road. Open week-round from 11am to 9pm, I'm pretty happy with this unassuming new discovery. While it's totally a no-frills kind of spot, it's inversely proportional to its deliciousness. Everything I ate was tasty and satisfying and so generously portioned that a take-away box for leftovers is necessary.